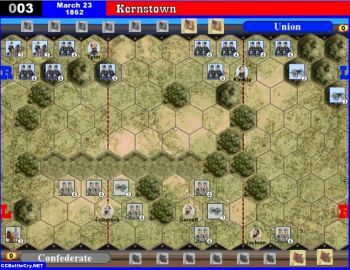 Lee planned to launch the main assault against the Union center. Longstreet had misgivings and cautioned Lee, but spent the morning readying his brigades for the attack. An artillery bombardment prior to the attack failed to inflict significant casualties or knock out the Union artillery. When Longstreet ordered the attack, the Confederates had to advance over nearly three-quarters of a mile of open ground, and as soon as the advance left cover it came under Union artillery fire. One of Picket’s divisional commanders, Lewis A. Armistead, with hat on the tip of his sword, led from the front and was one of the few soldiers that managed to reach the Union lines. Almost half of the Confederate troops engaged in the attack failed to return. 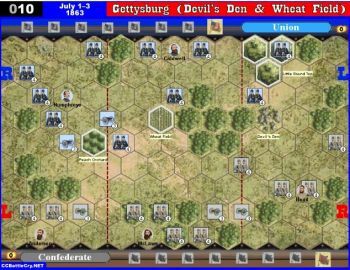 The Confederate loss at Gettysburg marked a turning point in the war. 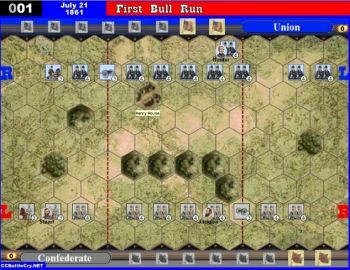 • Because of heavy fighting on day two, Pettigrew’s infantry units (on the left flank) each start the battle with only 3 pieces. 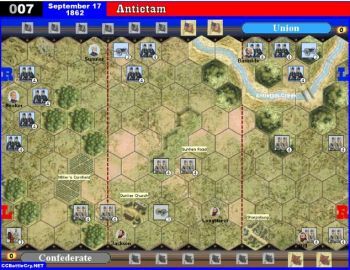 • At the start of the Confederate turn, if a Confederate infantry unit occupies any fence hex, it counts as one Confederate victory flag. Place the flag token on the Confederate victory stand. 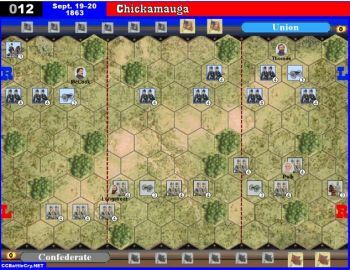 As long as the Confederate unit occupies the hex, it counts toward Confederate victory. If the unit moves off or is eliminated, remove the flag token from the victory stand. 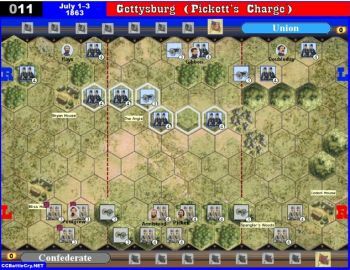 The Special Rules state: "To represent casualties lost earlier in the battle, Pettigrew's 3 infantry units each start the game with one less infantry piece." Can these units be rallied to 4 strength by play of the Rally card? No. The Rally card reads: "Roll 1 die for each card you have including this one. For each unit symbol rolled, return 1 eliminated figure of that type to an understrength unit of your choice in any section, up to that unit's initial number of figures. 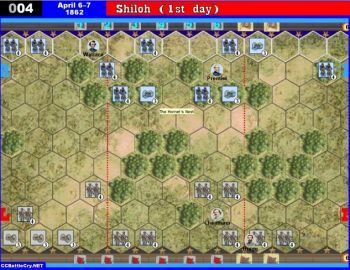 Each unit that gains at least one figure this way may battle but not move this turn." Can artillery on a hill shoot over the rough areas of the left (union) side of the map as if if were friendly units? Case in point: If the Union's artillery was on the hill overlooking the rough area could they shoot the Confederates in the Spangler's Woods area or right in front of the woods? No. (BC:150 p.14) A rough terrain hex blocks line of sight. 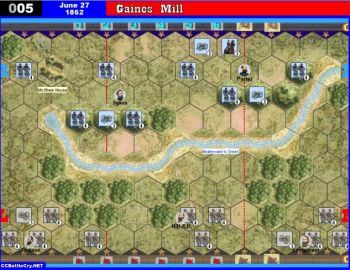 There are no special rules in the scenario to allow you to fire over the rough terrain hexes. 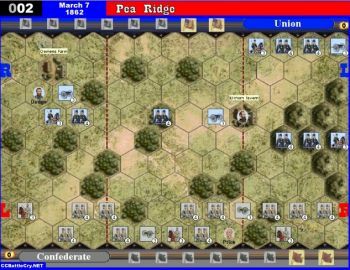 Artillery on the hill hexes on the extreme left of the Union flank would have clear line of sight to the area of Spangler's Woods. The artillery barrage is just what Lee tried...and it didn't work for him either. 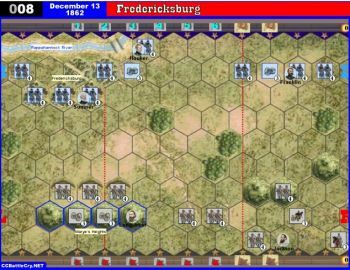 I want to try the scenario again and try what Longstreet wanted to do...flank 'em. Don't know if that will work either...but it's fun to try. but yes, the CS need some luck to win. 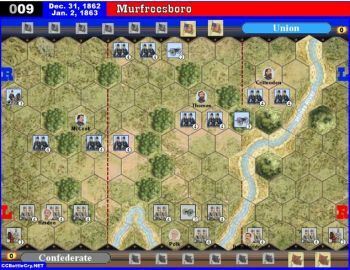 We have played this scenario twice and I (playing the Confederates) have lost twice. 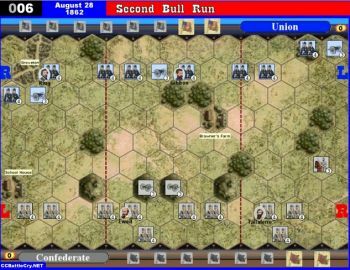 It seems this is, as in real life, a pretty difficult if not impossible scenario for the Confederates to win. One interesting note was that during Game #2 we actually made it thru the deck and had to reshuffle the cards. We made it thru about 1/4 of the second round of cards.